I get it; you like to live dangerously. You’re a major-league pitcher, a better athlete than anyone your hometown has ever seen. You’re confident and you should be. Conventional wisdom says when you see six-foot-four tanned Hercules at the plate you should probably pitch him inside so he can’t hurt you with his tree trunk arms. You’ve probably gotten a lot of great hitters out in your career this way. But can I offer you some different conventional wisdom? Unless you really enjoy giving up dingers, stop pitching inside to Carlos Correa. It’s not like he didn’t try to warn you when he first arrived in the big leagues. Zach Duke attempted to tie up Correa with an inside slider. It wasn’t a terrible pitch to a 20-year-old playing in his second career game. Probably not where Duke wanted it to go. Definitely not where Duke wanted it to land. One week later, Kyle Kendrick thought he found the solution. See, Duke just didn’t get his pitch far enough inside. Kendrick had Correa in an 0-2 hole and aimed his two-seamer at Correa’s right thigh. It was a foot off the plate. Way too close to the body for anyone to do anything other than break their bat or whiff completely. But Carlos Correa doesn’t play by your silly rules. Instead, he magically put the barrel to the ball and launched it into the Denver sky. But, hey, that was 2015. 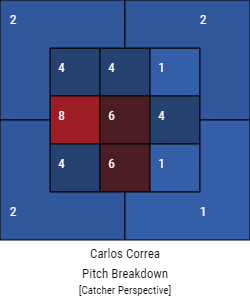 I’m sure you guys adjusted your plans to include the fact that somehow Correa has the strength of Mr. Incredible and the flexibility of Elastigirl, right? Nope. In the opening series of 2016, Michael Pineda threw a change-up down-and-in which Correa promptly relocated 462 feet away from where Pineda was trying to put it. Seven more times in 2016, one of you tried to throw a pitch on the inner-third before you watched Correa circle the bases. I know you guys are trying your best, but I’m not sure your best is going to be good enough here. Surely, surely former Cy Young winner Felix Hernandez would show you guys how to make excellent pitching decisions to start off 2017, though maybe not excellent neck tattoo decisions. Below you will find a chart of every home run Correa has ever hit. You will see that there are larger numbers on the inside part of the plate than there are on the outside of the plate. That is because the train to Dingerville departs roughly six inches away from the center of the plate. I can’t tell you what to do. I’m just trying to help. Don’t become just another statistic. Don’t challenge Carlos Correa inside.